PTPTN - How many of us took PTPTN? A lot I think. What do you think of PTPTN? Many of us saying PTPTN like licensed "Ah long". Me too ;-p... But don't you think without PTPTN maybe we cannot afford to further study. For me for SURE I cannot afford since I came from an average family. So, my point is - even though it is pain in the arce*, we still have to thank to PTPTN who helps us a lot back then. Right? So, I'm not gonna say about what PTPTN to us but How to repayment PTPTN. I did by using second account KWSP. I know some people say KWSP is for our future saving. It is very true. But we have to pay debt. What if we die before reach 50? Still cannot use that KWSP right? But in the end we bring debt until dead. Remember guys - we MUST pay all debt BEFORE we gone forever. So, back to the point, I did it using KWSP. It is pretty easy actually. I finished it within 2 days only. Thanks to the only brilliant idea of our government - UTC. 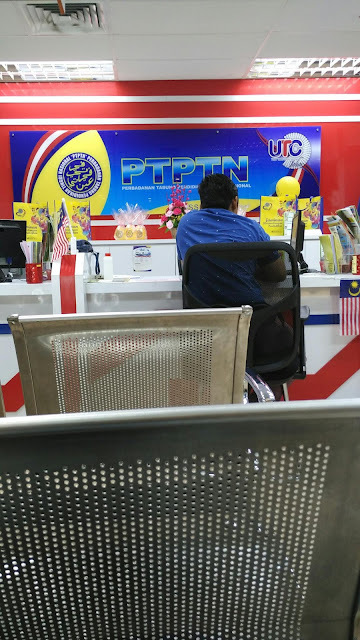 Day 1 - I went to PTPTN at UTC JB around 8 pm on Sunday. Very fast since not so many people on weekend at night time. I met this young girl said that I want to do repayment using KWSP. You only need to bring/show KWSP statement to her. I just show using KWSP apps that I downloaded just before I went there. But make sure you did have online account first. Ok, then she told me the procedure to do repayment. It is very simple - 1. Prepare RM 90 if you don't have the original agreement (she will prepare for you). If you do have just bring it. 2. She (PTPTN) will prepare surat pengesahan. In my case she just email me the documents that I need to bring to KWSP. Day 2 - I print out the required documents (stated below) and came back to PTPTN counter to take surat pengesahan (with PTPTN's stamp), then bring the documents to KWSP. At KWSP, you only have to queue. At the counter, fill in the document and DONE. You can pay as much as you want. My advice, if you are still using conventional (3% interest), just pay "baki tertunggak" like RM5K for example. Then you do "Ujrah" to turn all balance into 1% interest. After 3 months, you can do repayment using KWSP AGAIN. By that time your "Ujrah" already valid so you can save a lot! In my case they didn't explain about this so I lost quite a great amount. Please take my advice. Oh...this info might not spread good enough. You can do repayment for how many as you want. The interval between repayment is 3 months. Which mean you can do again in the next 3 months. The only thing is you must have enough money in your KWSP lah! Simple is it? If you stay in JB and require assistant I can help. I also can give you contact person that can help you - Ms. Mohnita. She helps me a lot. She even update me when the payment completed. Great service! Okay guys...if you have anything to ask you can put in the comment. I'll reply ASAP. May I know roughly how long does it takes to transfer money from EPF to PTPTN? I went to KWSP today to the same thing. And then the lady at the customer service counter where you take your numbers told me that I need to receive an SMS then I can do it, otherwise, they are still processing. Did this happened to you? Please advise.. Cool! Thanks for this, writer! what do you mean for Letter of agreement ? PTPTN loan agreement? Can I use my sibling epf account to pay my ptptn? how many time i can use epf to pay my outstanding ptptn?